The Dog On The Roof – Men's Stag Group Meeting of Alcoholics Anonymous was established in Fullerton, California on April 15, 1962. 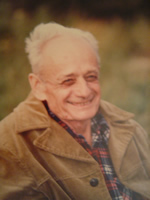 The meeting was held at one of our founders, Ivan Miller's house every Thursday night until we moved to another location in November of 1985. Members would show up as early as noon to save seats – if you showed up late which was a couple of hours before the meeting started, you had to sit outside in the backyard and listen to the meeting through the open windows. The meeting was held in the back house which was not much bigger than a normal size living room. 40 plus men would squeeze into this house and we were packed in there so tight you could literally feel what kind of day the guy sitting next to you was having. After Ivan's death we were able to hold the meeting at the house for about one year. When the situation was no longer conducive to holding our meeting there with complete autonomy Keith D., the remaining living and still active old timer, moved the meeting to Placentia to a city park recreation center. For a period of about 5 years we moved from park to park without much success – our cars were always getting broken into on a regular basis and we were always subject to meeting closures due to public holidays. Around 1990 and only because of the loving support and cooperation from the members of the Gottawanna Al-Anon Family Group we were able to get ourselves a good old fashion meeting hall, where we could enjoy having our meetings with complete autonomy - simply put autonmous in that we don't have to close our meeting down on holidays like we used to have to when we rented out public spaces. Since 1990 we have had 5 meeting halls. Each move has placed us in a new hall that was one step above the last one. To this day the Dog on the Roof maintains our founder's teachings. Alcoholics Anonymous in it's most basic and effective form – one drunk helping out another drunk. God, AA, Steps and Strong Sponsorship a winning combination. We have carried on and maintain the entire Dog on the Roof groups meeting archives and they are displayed in our hall. So how did the meeting get its name? The story goes that when Ivan was drinking his wife told him that he had a choice to make. It was "either the booze has to go or you got to go". Like the good alcoholic he was, he decided to go live in the shed/back house that was located close to the detached garage so that he could drink in peace. He had all the amenities he needed in the little house a bed, a sink, and a bathroom. Ivan decided to fix the roof after a particularly rainy night when the roof leaked and his bed was soaked. While fixing the roof he noticed his dog was trying to get up where he was and started to climb the ladder. Soon, the dog would be up on the roof. As time went on Ivan started to fix the roofs on the garage and the main house. As he went from building to building, he built ramps so the dog could follow him where ever he went. During this time Ivan was granted the gift of sobriety, moved back into the big house and started having meetings in the back house. 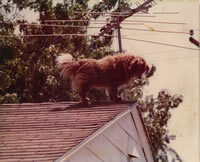 When newcomers would ask what the noise was on the roof, Ivan would tell them "oh, that's my dog. He's on the roof because he likes going up there where he can go from the front house to the garage and to the back house and see more than can then when he is on the ground". And so was born the Dog on the Roof. The oldest continuous Men's Stag Group of Alcoholics Anonymous in Orange County. The Dog On The Roof Group – Men's Stag meeting of Alcoholics Anonymous. Our meeting was in established on April 15, 1962. We meet in Anaheim California . This website includes pictures of our meeting hall, directions to the hall, a brief history or our Alcoholics Anonymous group. You will also find email addresses of some of our members, a contact phone number, MP3 files of AA and Al-Anon speakers. Please enjoy this site for fun and free - borrow, use and pass on what ever you find in the love and the fellowship of the spirit. God bless all the lost souls in and out of the program.